To add a new expense item click on "+ Add New", to edit click on "Edit". The medication entry screen will display. Medication is to be entered by individual animal. 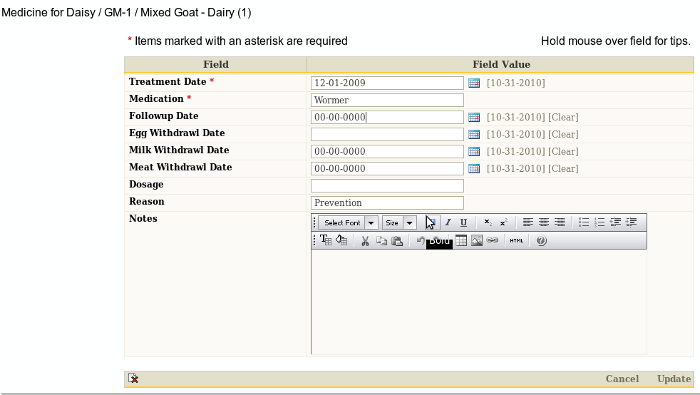 The example (above) records the wormer medication being give to the goat named Daisy. If there is a follow-up date for this medication enter it as a reminder. Treatment Date (Required entry) Select the date the medication was given. Medication (Required entry) Enter descriptions such as weekly total, special details, etc... The maximum length of this field is 50 characters. Milk/Egg Withdrawl Date (Recommended entry) Select the withdrawl date, the date milk or eggs can be used again. Meat Withdrawl Date (Recommended entry) Select the withdrawl date, the date meat can be used. Dosage (Recommended entry) Enter the dosage of the medication given. The maximum length of this field is 25 characters. Reason (Recommended entry) Enter the reason the medication is given. The maximum length of this field is 50 characters. Notes Field length is unlimited. Use this area to record details which need a detailed explanation.